Size of Male: 50-75 lbs., 22-27 in. Size of Female: 40-65 lbs., 21-25 in. The Plott Hound is an old breed that has been bred in the mountains of Appalachia for the last 200 years. Plotts are eager to please, loyal and intelligent. These dogs are still used for hunting bear, boar and other large animals in many areas but they do make very good family companions. The Plott is a very athletic dog and requires a great deal of daily exercise. If you own a Plott Hound you can expect to hear his “voice” in the home at times since these dogs to bay. The Plott Hound has a very well-known history. In 1750 two brothers named Plott left Germany with five Hanoverian Hounds (a kind of bloodhound) which had been used for large game hunting in that country. One of the brothers died on the voyage to America but the other brother settled in North Carolina and bred his dogs. For the next 200 years his descendants continued to breed the dogs. These Plott Hounds (named after the family) were used to hunt bear, boar and other large game in the Appalachians. They were very popular with other mountain people who also bred them. The dogs are also used to hunt raccoons but they are primarily a large game dog. 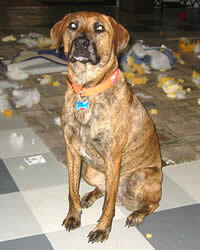 The Plott is a bright, kind, confident and courageous dog. They are very intelligent dogs and learn quickly. They may be indifferent to other dogs but they are very eager to please people. They make very good family pets. Plotts do require a great deal of exercise. They need to be outdoors a large amount of the time. They can be happy being near their owner indoors but they still like to be outside. Make sure that they are in a safe, enclosed area since they have a tendency to follow their nose. These dogs are very loving and they get along very well with children. However, when it comes to work and hunting, these dogs are all business and they can fearlessly corner a bear. Living Environment – This is not a good dog for apartment life. These dogs need lots of exercise and they like to be outdoors when possible. They enjoy being near their owners and do well in a rural lifestyle. Grooming – Grooming for this dog breed is easy. They have a short, sleek coat that needs to be brushed a couple of times per week. They are average shedders. Bathe as needed. Diet & Exercise – Dietary needs are normal. This breed does require a great deal of daily exercise. They have tremendous stamina and will enjoy a chance to run off-leash. However, make sure they are in an enclosed area – these dogs will give chase to animals and hunt if they have the opportunity and they may not return when you call them. They do well in a large, fenced yard. Health – The Plott is considered a very hardy breed but they can be prone to gastric torsion or bloat. Do not allow this dog to exercise immediately after eating. If you are interested in this dog breed, you should talk to a breeder about dog health problems in the breed. The Plott Hound is a very intelligent dog with a strong desire to please. Dog training for this breed is considered reasonably easy. However, they may not always listen to their owner, especially if they become distracted by game to hunt. If a Plott becomes involved in hunting he will probably ignore you if you try to call him back. These dogs must be trained and socialized from a young age in order for the owner to have more control of them. This can also help prevent them from chasing family pets. Positive dog training (praise, rewards) works very well with this breed.